Earlier today, a mailer which attempts to dishonestly smear Katrina Foley was sent to many Costa Mesa residents. Sadly, this is nothing new. Nevertheless, we are compelled to look under the hood of this particular hit piece because we believe that you deserve to know who sends these baseless attack ads. To explain the source of this mailer, let’s go back to January 13, 2018. That was the day when President Trump finally visited the largest state in the country (after being in office for almost an entire year). 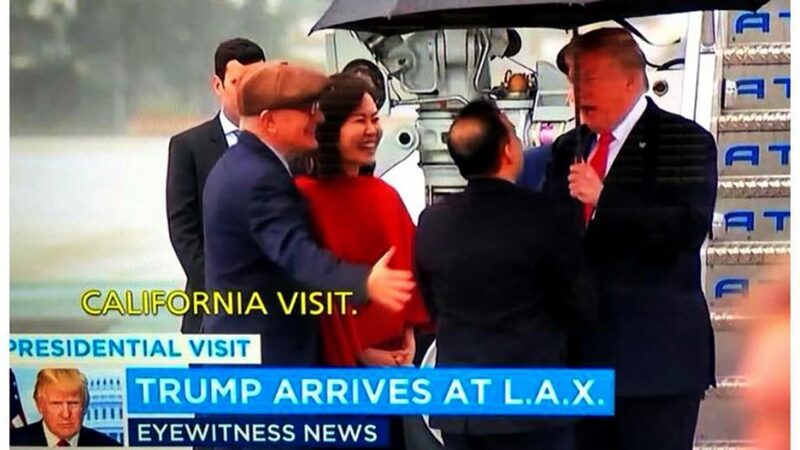 Although nearly 40 million people live in California, only three people were waiting on the LAX tarmac to greet Trump when he arrived. One of those three people was a man named Shawn Steel (you can read the full story here). Mr. Steel is a longtime GOP operative, a regular fixture on Fox News, and married to our County Supervisor, Michelle Steel. We have heard rumors that he was also the best man at Dana Rohrabacher’s wedding, but thankfully we did not attend that event, so we cannot directly confirm the nature of their relationship. In any event, Mr. Steel now wants Sandy Genis to be Mayor of Costa Mesa. Given that Mr. Steel does not live in Costa Mesa, there should be two collective questions: (1) why is Mr. Steel working so hard to get Genis elected, and (2) why should any non-Trump supporter trust his taste in politicians? But we digress…back to the mailer. The required disclaimer reveals that Mr. Steel provided “major funding” for the mailer. 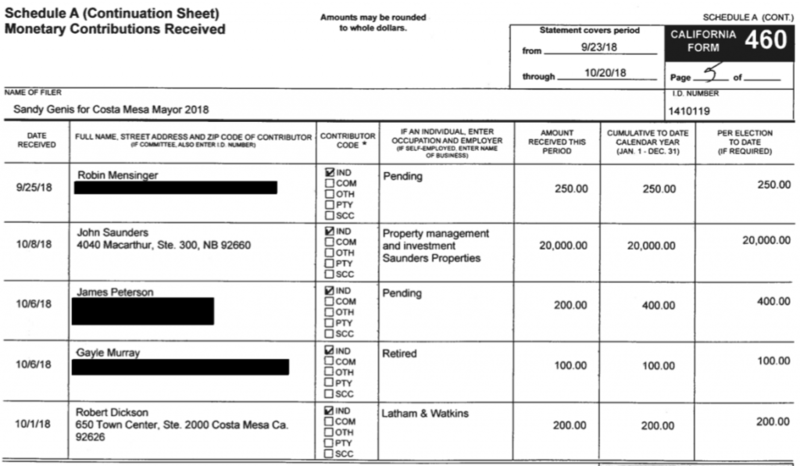 Amongst other artifice and deception, Mr. Steel’s mailer contends that Foley has received campaign contributions from Sacramento PAC’s (i.e., Firefighters), while Genis has not. As far as we know, it is true that no public safety organization has chosen to support Ms. Genis, and that should be concerning to those who value the services of our community’s emergency responders. Moreover, it is beyond misleading to imply that Ms. Genis has not received large special interest contributions. In fact, Ms. Genis has accepted a $20,000.00 payment from a large commercial real estate owner/investor. View entire document on City of Costa Mesa website here. Learn more about this particular investor here. The $20,000.00 donation is, by far, the largest contribution that any local candidate has received this election cycle. What do you surmise that donor expects in return for his investment in Ms. Genis’ campaign? Of course, there are other smoke-and-mirrors parlor tricks in Mr. Steel’s mailer, but you get the idea. Don’t be fooled by the snake oil salesmen and dirty tricksters. If you follow the money, and know the source, you can usually unveil the motives behind the gamesmanship. In years past, Mr. Steel may have gotten away with his shadowy tactics, but not anymore. An army of people are now watching, and we stand ready to expose falsehood and hypocrisy, whether we find it in our mailbox or elsewhere.